An editorial cartoonist often uses humor to illustrate a news item. What recent news item is Bob Englehart illustrating in this cartoon? 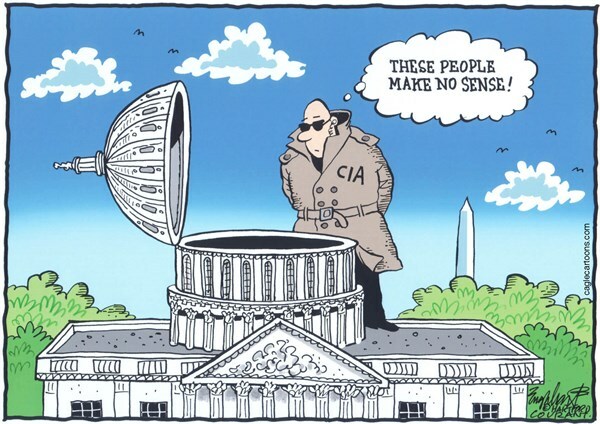 Englehart is illustrating Senate Intelligence Committee Chairwoman Diane Feinstein’s accusation that the CIA secretly hacked into Senate computers to determine what was in the committee’s report on the CIA’s secret detention and interrogation program conducted on suspected terrorists held in secret overseas prisons. The report is said to be a searing indictment of the program. The CIA has disputed some of the reports findings.